This latest dispatch from the great musical world extending beyond American shores is dedicated to the inauthentic, with absolutely no pejorative connotations intended. Let the folklorists and preservationists continue their good work — attached you’ll find examples of juicy cross-cultural pollination: Senegalese visionaries swapping out koras for congas, Brazilian punks basking under the Kingstonian sun, and Cairo club rats running chaabi beats through the wood chipper. Guaranteed to annoy the purist in your household. 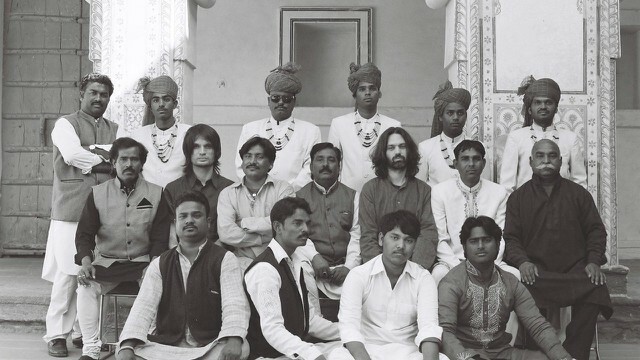 It’s tempting to dismiss the presence of Radiohead’s erstwhile guitar wizard on Junun as a rock star slumming under the guise of post-production tweaker. Only it turns out Jonny Greenwood’s electric fuzz, supplementary rhythms, and beloved vintage Ondes Martenot synthesizer add real bulk to this Middle East meets East plus West experiment in cultural diplomacy. But certainly, Israeli singer/songwriter Shye Ben Tzur’s name belongs up top, swaggering his way through Hebrew, Hindi, and Urdu verses while the Rajasthan Express brass band brings their 19-piece heft to a Bollywood/Sufi Islam collision course that makes room for drum machines, harmonium, and three tubas. And give it up for Aamir Bhiyani’s soaring trumpet, which lends the opening title cut an electric Miles vibe underscored by a stuttering Michael Henderson-ish bass riff played by — guess who — Mr. Greenwood. Sub-standard Afro-funk compilations are a dime a dozen — you wanna hear phonetic approximations of “I’m a Greedy Man,” have at it. This typically lavish offering from the tireless archivists at Analog Africa and Teranga Beat is something different, the early stirrings of post-colonial Dakar’s Afro-Cuban explosion. A sweltering club scene and cosmopolitan appetites encouraged excursions into hybridization, in which Cuban son montuno mixed easily with American soul and native mbalax. Fangool’s “Mariama” kicks off with a Sly & Robbie groove, Orchestra Bawobab (a.k.a. Baobab) offer up Senegalese salsa, King N’gomi drops some good time call-and-response on boogaloo/son mashup “Viva Marvillas.” History buffs will have a blast connecting the multicultural dots, like when Guinean bandleader Amara Touré makes his brief appearance on “El Carretero,” originally composed by guajira legend Guillermo Portabales and destined for wider exposure once the Havana-based Buena Vista Social Club got their hands on it decades later. Authenticity — who needs it? If Syrian dabke darling Omar Souleyman’s latest offering (2015’s Bahdeni Nami) left you wanting a bit more in the cacophony department, try this EP from a Cairo-based three piece electro-chaabi outfit, in which keyboard nihilist Islam Chipsy deploys full-fisted horrible noise over the propulsive rhythms of drum duo Khaled Mando and Islam Ta’ta’. Shoving Mario Bros. skronk clusters through cheapo amps until they redline like “Steppin Up”-era M.I.A. (who should ring these guys up), these four breakneck tracks are less Cairo clubwork than No Wave wedding party. ten-minute pounders “Trinity” and “Kahraba” bookend the EP with minimal variations on tinnitus-inducing racket. In between, “Mouled Saidi” transforms traditional Egyptian folkcraft into a distortion-edged banger while “El Bawaba” allows Chipsy room to pledge fealty to Bernie Worrell. Pairs nicely with Nashazphone’s concurrent release Studio Sardena, in which various Cairo MCs drop verse over the electro din. The Senegalese elder statesman has no need for the Auto-Tune he sparingly yet startlingly deploys on this long-awaited followup to 2009’s Television — at a relatively spry 62, Maal’s voice retains both upper register strength and youthful clarity. So figure the digital tomfoolery is a conscious choice meant to signal direct engagement with Western capital, the same sort of compromise that finds him sharing banjo licks with a Mumford on the title cut or drifting into Arcade Fire territory on the pounding “Lampenda”. But scruffy guests and pop tricks barely disrupt Maal’s line of attack. Opener “Fulani Rock” matches throbbing djembe with circular guitar snarls, all the while insisting upon the moral and political primacy of native tongues. On the opposite side of the spectrum, “Kalaajo” strips down to essentials: Maal’s unadorned quiver, acoustic flitters, and electric guitar drenched in echo. Concluding tracks “War” and “Peace” rely heavily on Ethiopian/U.K. author Lemn Sissay’s bravura Beat poetry skills, nattering on about “media hype” and slogans falling like hard rain. Sissay’s aggression may seem at odds with Maal’s nearly Zen-like calm. But as a statement of pan-African cultural solidarity, the pairing makes perfect sense. Be sure to add West African nation Mauritania to your laminated Wedding Singer Belt map — that huge swath of the planet stretching from North Africa and the Balkans through Turkey and the Middle East all the way over to the Indian Subcontinent, where betrothed and guests alikr always play second fiddle to hotshot bands and their killer MCs. Sahel Sounds label founder Christopher Kirkley crashed a dozen-odd wedding bashes across the teeming metropolis of Nouakchott, documenting the ragged glory of open-air celebrations surging with reconfigured electric lutes, blissful pedal-aided guitar solos, hectoring vocals on blown-out PA systems, and trap drummers rushing to match the pace. Fleet-fingered lutist Hussein Moktar and desert shredder Sidibou ould Slyed in particular bring the audio vérité grime. Twitchy Johannesburg rapper Smiso Zwane has lit up guest spots on outings with fellow South Africans Casper Nyovest and Spoek Mathambo, and helped enliven London duo LV’s Hyperdub-sponsored Sebenza, but for those awaiting a proper follow-up to Okmalumkoolkat’s dense 2014 EP Holy Oxygen, this free mixtape might suffice. A grimy melange of hip-hop, Motswako, and Township Tech, the ‘kat rides the tinniest of beats and the glitchiest of keyboards, taking time out for one synth-drenched R&B ballad and reworking local kwaito god M’du on the DJ Zharp-Zharp produced title cut, which gets chopped-and-screwed a few tracks later. And good luck parsing the (many) skits, which are mostly in Setswana.